Pathogens rely on proteins embedded on their surface to perform tasks essential for host infection. These obligatory structures exposed to the host immune system provide important targets for rational vaccine design. Here, we use a systematically designed series of multi-domain constructs in combination with small angle X-ray scattering (SAXS) to determine the structure of the main immunoreactive region from a major antigen from Leptospira interrogans, LigB. An anti-LigB monoclonal antibody library exhibits cell binding and bactericidal activity with extensive domain coverage complementing the elongated architecture observed in the SAXS structure. Combining antigenic motifs in a single-domain chimeric immunoglobulin-like fold generated a vaccine that greatly enhances leptospiral protection over vaccination with single parent domains. Our study demonstrates how understanding an antigen’s structure and antibody accessible surfaces can guide the design and engineering of improved recombinant antigen-based vaccines. Vaccines encourage the immune system to develop a protection against disease-causing bacteria and viruses. Some types of immune cells release antibodies, which recognize particular proteins on the surface of the invading microbe. A vaccine that contains these surface proteins allows immune cells to develop the antibodies that can help to fight off an infection at a later date. Studying the shape and structure of the surface proteins can reveal how they are detected by our immune systems and can further be used to design more effective vaccines. Leptospirosis is the most common bacterial disease to affect both humans and animals. The symptoms of the disease include fever, muscle pain and bleeding from the lungs. New vaccines against leptospirosis are desperately needed because current ones have severe side effects and do not fully protect against the disease. The most promising new vaccine candidates are the Lig proteins, which are found on the surface of leptospirosis causing bacteria cells, but little was known about their molecular structure. The region of the Lig protein that is recognized by the immune system consists of a series of twelve connected ‘immunoglobulin-like’ domains. Hsieh, Ptak et al. used X-ray scattering to determine the structure of this region and found that the protein is highly elongated. Additional experiments showed that the individual domains provoke immune responses to different extents. Antibodies that can interact more strongly with the Lig protein were also better able to kill the bacteria. Based on this information, Hsieh, Ptak et al. combined parts of the individual domains that bind strongly to antibodies to design a new protein that, when used as a vaccine, protected hamsters against leptospirosis much better than other Lig protein-based vaccines. Further engineering and testing are required to develop an optimized, commercial leptospirosis vaccine, but the work of Hsieh, Ptak et al. shows the effectiveness of structure-based vaccine design methods. In the future, similar methods could be used to develop better vaccines and treatments for other infectious diseases. The molecular details of how surface antigens of a pathogen are exposed to the host’s defenses are highly relevant to rational vaccine development (Rappuoli et al., 2016; Dormitzer et al., 2012; Dormitzer et al., 2008). The structural context of immunologically accessible epitopes allows for the redesign of recombinant vaccine scaffolds to display the most antigenic surfaces (Correia et al., 2014; Malito et al., 2014). The exploration of recombinant strategies can be particularly fruitful when classical vaccine strategies provide weak protection. Currently available inactivated vaccines against leptospirosis, the most common bacterial zoonosis (Picardeau, 2017), are inadequate because of the severe side-effects and lack of cross-protection among pathogenic Leptospira species (Grassmann et al., 2017; Adler, 2015). Because the estimated worldwide burden of leptospirosis is over 1 million severe cases and ~60,000 deaths per year, advances in recombinant leptospiral vaccines are desperately needed and are likely to benefit from a structure-based antigen design strategy (Picardeau, 2017; Costa et al., 2015). While several leptospiral antigens have been explored for use in vaccines, the most promising candidates have been derived from the Leptospira immunoglobulin-like (Lig) protein family (Ko et al., 2009; Grassmann et al., 2017; Cao et al., 2011; Yan et al., 2009; Chang et al., 2007). Lig proteins are present in only pathogenic species with LigB (but not LigA or LigC) being found in all pathogenic Leptospira genomes (McBride et al., 2009; Matsunaga et al., 2003), LigB’s expression during host invasion further suggests an important role in virulence (Lessa-Aquino et al., 2017; Choy et al., 2007). To promote infection, LigB can bind multiple blood factors and extracellular matrix molecules (ECMs) to facilitate immune system evasion and tissue colonization (Choy, 2012; Vieira et al., 2014; Figueira et al., 2011). The persistence and exposure of LigB on the leptospiral outer membrane during infection leaves an exploitable vulnerability. Recently, a hamster immunization study has suggested that LigB-derived vaccines have the potential to confer sterile immunity against leptospiral challenge (Conrad et al., 2017). The new study (Conrad et al., 2017) is inconsistent with earlier LigB vaccine studies which only confer partial protection (Yan et al., 2009; Silva et al., 2007) and raises the possibility of further improvements in LigB-derived vaccine efficiency through rational design. Our understanding of the LigB structure is limited to the NMR structure of the individual Lig protein Ig-like domain (Ptak et al., 2014). LigB is attached to the leptospiral outer surface by a short N-terminal anchor, which is followed by a stretch of twelve consecutive Ig-like domains, and flanked at its C-terminus by an additional non-Ig-like domain (Figure 1—figure supplement 1A). Most host interactions with Lig protein have been identified within the Ig-like domain regions and previously reported LigB-based vaccines have targeted the Ig-like domain region (Yan et al., 2009; Conrad et al., 2017; Breda et al., 2015; Lin et al., 2009a). A more comprehensive understanding of the domain arrangement would provide a picture of the most accessible antigenic regions and a guide for structure-based vaccine design. In this study, small angle X-ray scattering (SAXS) (Skou et al., 2014) was used to obtain a low-resolution solution structure of the Ig-like domain region’s architecture. The full LigB Ig-like domain region’s extended arrangement with notable bends encouraged the exploration of the highly-exposed surface for immunoreactivity with a library of anti-LigB monoclonal antibodies (mAbs). The capability of these mAbs to bind antigen and to adhere to the surface of pathogenic Leptospira was then correlated with their ability to kill these bacteria in the presence of serum complements. Finally, the identified mAb-reactive domains and previously obtained LigB12 (LigB 12th Ig-like domain) NMR structure informed the generation of chimeras on single Ig-like domain scaffolds capable of eliciting an immune response with either side of the β-sandwich domain. 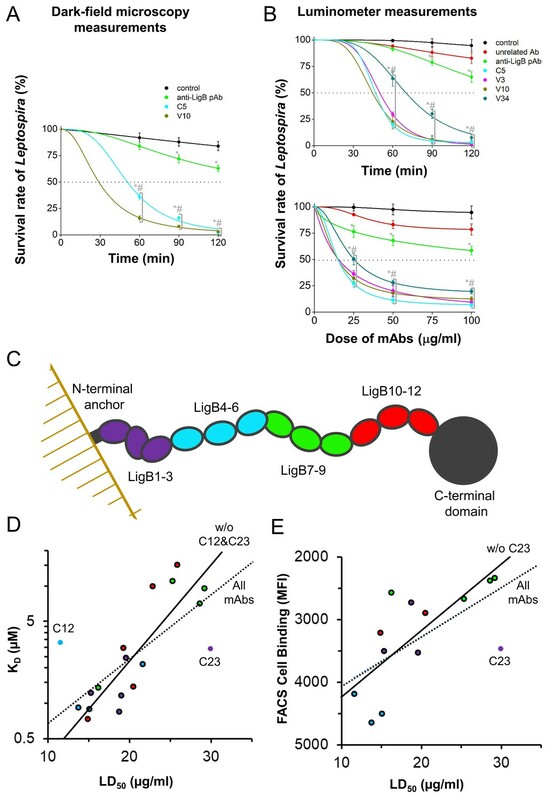 To illustrate the potential for rationally engineered antigens, a vaccine containing the chimera LigB10-B7-B7, which displays identified mAb-interacting surfaces from LigB7 and LigB10, offered greatly improved protection over LigB7 and LigB10 against leptospiral lethal challenge in hamsters. These findings provide a blueprint for combining immunoreactivity mapping from an mAb library and high-resolution structural information from NMR to engineer epitopes and improve the efficacy of LigB vaccines as well as recombinant vaccines from other pathogens. To determine the architecture of the twelve Ig-like domain stretch in LigB, small angle X-ray scattering (SAXS) was used to generate low-resolution solution structures along a sliding multi-domain window. Because the 5-domain length contains four domain-domain linkers, the 5-domain structure proved to be optimal to define the relative angle of two neighboring domain-domain joints with one additional joint on each end (See Materials and methods for rationale; Figure 1—figure supplement 1). All eight possible 5-domain protein constructs (LigB1-5 to LigB8-12) were analyzed with SAXS (Figure 1; Figure 1—figure supplement 2). Guinier fits and Porod analysis suggested minimal aggregation for all but LigB5-9 (Figure 1—figure supplement 2B and Figure 1—source data 1). The simulated fits to the experimental SAXS curves for the eight 5-domain constructs (Figure 1A; Figure 1—figure supplement 2A) were used to generate the atomic distance distribution for the molecules (Figure 1B). The longest atomic pair distance deduced from the pair-distance distribution function (P(r)) is indicative of the length of the 5-domain proteins. The expected length of a fully extended arrangement of five folded LigB Ig-like domains is only slightly longer than the pair distance for most of the eight 5-domain proteins and their corresponding envelopes (Figure 1B; Figure 1—figure supplement 2C). LigB5-9 has an atomic pair distance that exceeds what is possible for a folded 5-domain monomer (in agreement with aggregation indicated by the difference between experimental and predicted molecular weights, Figure 1—source data 1) and was excluded from the final model. Full LigB Ig-like domain region (LigB1-12) determined from experimental SAXS data of 5-domain constructs. (A) The experimental scattering data for LigB8-12 (black) is shown with the simulated fit (red). The scattering curve is an average of 15 scans ± S.D. (B) The pair distance distributions, P(r), were calculated from SAXS plots of all possible 5-domain LigB Ig-like domains using GNOM. A representation of the 5-domain constructs is shown in the inset. An estimate of construct length based on the longest atomic distances at 20%, 15%, and 10% max population height are shown. (C) DAMFILT envelopes were combined to create a representative envelope of the twelve Ig-like domains. Construct LigB5-9 was not included because the maximum distance distribution exceeds the expected length of a 5-domain construct. Ambiguity assessment using the AMBIMETER program (Petoukhov and Svergun, 2015) shows that the first six structures (LigB1-5 to LigB6-10) have a high degree of uniqueness with ambiguity scores of 0.3 or lower. The last two structures (LigB7-11 and LigB8-12) have scores of 1.7 and 1.4 respectively, which indicates the potential for shape ambiguity. Each of the eight 5-domain SAXS envelopes exhibited distinct structures with a variety of domain-domain angles (Figure 1—figure supplement 2D). A significant degree of bending is present between the first three domains. The stretch of domains between LigB3-6 is particularly straight. Slight bending in the angle between domains in the final five domain stretch produces a gentle spiral shape. By aligning the bends in the four shared domains of neighboring 5-domain regions, a best fit structure was generated for the full twelve Ig-like domains of LigB (Figure 1C). Overall the LigB1-12 structure is only 16% shorter than a fully extended model structure of twelve folded domains. The SAXS-derived structure of LigB1-12 demonstrates that most of the individual Ig-like domains exhibit a high degree of exposed surface area and suggests a high degree of accessibility to host interactions. The extensive exposed surface area is a consequence of the unexpected rigid, rod-like structure, with several well-defined kinks. To explore the exposure of the LigB Ig-like domain region to a host immune response, two purified LigB truncations, LigB1-7 and LigB7-12 (Figure 2A), were used to generate two sets of hybridoma cell lines for mAb production: library C (24 mAbs) and library V (36 mAbs), respectively. Using ELISA, hybridoma supernatants containing anti-LigB mAbs were qualitatively screened for the ability to bind to their respective LigB truncations (Figure 2B). Based on the distribution of antigen binding efficiencies, a threshold level was set to OD630 = 1.0 (Figure 2—figure supplement 1). Only mAbs with binding above the threshold level were purified for further characterization of binding properties and bactericidal activity. Screening of library V required an additional twelve mAbs in order to equal the nine threshold-level mAbs identified in the library C screen. ELISA screen of anti-LigB mAb library. (A) Depiction of the full length LigB antigen and LigB-derived antigens used for mAb generation. (B) The degree of mAb binding to the respective LigB antigens was indirectly measured by colorimetic (λ630) TMB-ELISA using rabbit anti-mouse IgG antibody conjugated with HRP (1:5000). Each value represents the mean ±S.D. from three individual trials of two replicates. Additional mAb characterization was limited to mAbs with binding efficiencies resulting in OD630 >1.0 (blue). For each library, nine mAbs were identified to have moderate to high binding efficiency to LigB antigens during the initial mAb screen. The dissociation constants (KD) for each of these mAbs was obtained from dose-dependent ELISA curves (Figure 3; Figure 3—figure supplement 1; Table 1). Based on KD values, library C mAbs were generally able to bind tighter to the LigB antigen than library V mAbs. Several library C mAbs (C5, C6, C7) exhibit sub-micromolar KD values while only one library V mAb (V10) was able to bind in the sub-micromolar range. Equilibrium binding for anti-LigB mAbs. The equilibrium dissociation constants (KD) for mAbs from library C (A) and library V (B) were determined from dose-dependent binding curves. Increasing concentrations of purified anti-LigB mAbs (0.00686, 0.0137, 0.0412, 0.123, 0.370, 1.11, 3.33 and 10 µM) were incubated with LigB antigen (1 μM) immobilized on microtiter plates. The binding interaction was subsequently detected by ELISA using HRP-conjugated anti-mouse antibodies. All experiments were conducted in three trials, the mean ±S.D. of which were shown in bar charts. Mean values for the dissociation constant (KD), FACS cell binding propensity (MFI), and lethal dose (LD50) are listed for mAbs against LigB1-7 (library C) and LigB7-12 (library V). Double and single domain specificities for mAbs are also noted. C9 2.440 3530.0 19.56 LigB1-2 n.s. C10 2.162 21.63 LigB4-5 n.s. C23 2.916 3469.5 29.92 LigB2-3 n.s. n.s. no significant binding partner was determined. Domain-level specificity of individual LigB mAbs was investigated using a comprehensive set of single Ig-like domain LigB truncates and tandem (double) Ig-like domain LigB truncates (except LigB5-6) based on the NMR structure (Ptak et al., 2014) of the single domain, LigB12 (Figure 4—figure supplement 1). The LigB-derived antigens were immobilized on microtiter plates and tested for mAb binding specificity using an ELISA binding assay. The ELISA results for individual mAbs were generally able to localize binding to a specific double and/or single Ig-like domain. Figure 4A illustrates the ELISA assays used to identify the binding of mAbs C5 and V10 for specific two-domain regions and for specific single Ig-like domains. A comprehensive survey of domain-level epitope mapping for different mAbs are summarized in Table 1 and Figure 4—figure supplement 1. For the LigB1-7 antigen-derived library, immunoreactivity of mAbs was weighted towards LigB1-2 and LigB4-5 regions, while for the LigB7-12 antigen-derived library, mAbs were preferentially generated against LigB7-8 and LigB10-11 regions. Only 3 of 10 double domains, LigB3-4, LigB6-7, and LigB8-9, and 2 of 12 single domains, LigB3 and LigB11, lack immunogenicity for the set of tested mAbs. From an antigenic response to LigB1-7 and LigB7-12, at least every other individual Ig-like domain is capable of eliciting mAb production and the generated-LigB mAb libraries cover the length of the LigB Ig-like domain region. 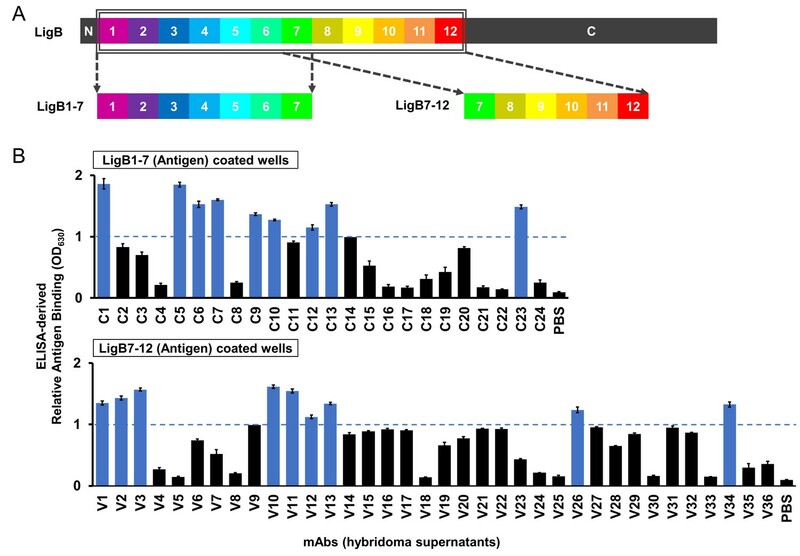 Several anti-LigB mAbs were tested using fluorescence-based flow cytometry for the ability to recognize native proteins on the surface of Leptospira cells. The spirochetes were incubated with mAbs from library C or V. Anti-LigB mAb-bound Leptospira cells were fluorescently-labelled with anti-mouse IgG antibodies and counted by flow cytometry. The strong fluorescence signal from incubation of the pathogenic L. interrogans serovar Pomona cells with anti-LigB mAb C5 was indicative of a tight cell surface interaction (Figure 4B). Cells incubated with either PBS (Figure 4B) or the negative control mAb C22 (Figure 4—figure supplement 2A) failed to generate a fluorescence signal after secondary anti-mouse IgG antibody incubation. Additionally, cells from L. biflexa, a non-infectious Leptospira species which lacks the genes for Lig proteins (Figueira et al., 2011), also failed to exhibit a fluorescence signal strong enough to indicate binding after anti-LigB mAb C5 incubation (Figure 4—figure supplement 2A). A total of seven library C mAbs and six library V mAbs were measured for Leptospira surface binding character and all produced a fluorescence signal count over three-fold higher than the PBS control and over two-fold higher than the poorly binding mAb controls (C22 and V33) (Figure 4—figure supplement 2B). The cell binding propensities for measured mAbs are listed as mean fluorescence intensity (MFI) values in Table 1. The flow cytometry data supports the presence of mAb-accessible Lig protein Ig-like domains on the surface of Leptospira cells. (A) A representative example of domain-level epitope ELISA-based mapping for anti-LigB mAbs (full dataset Figure 4—figure supplement 1). The mean ±S.D. for three trials is displayed. 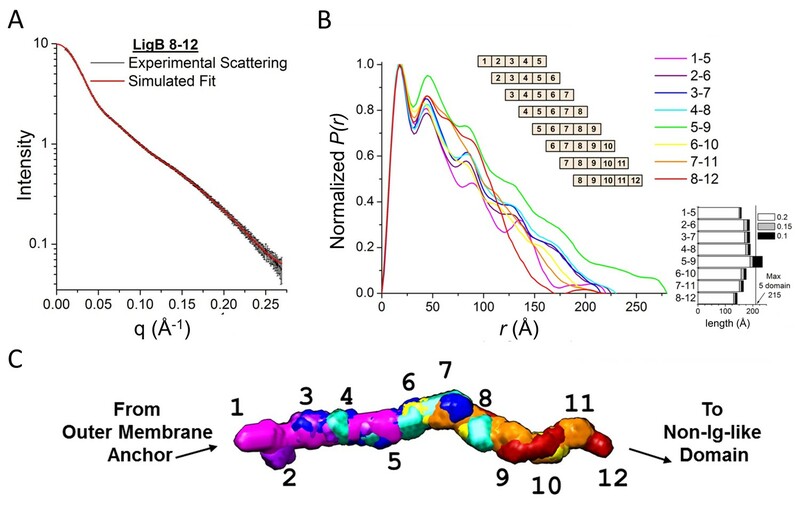 (B) Flow cytometry was used to measure the ability of anti-LigB mAbs to bind directly to live Leptospira (Figure 4—figure supplement 2B). 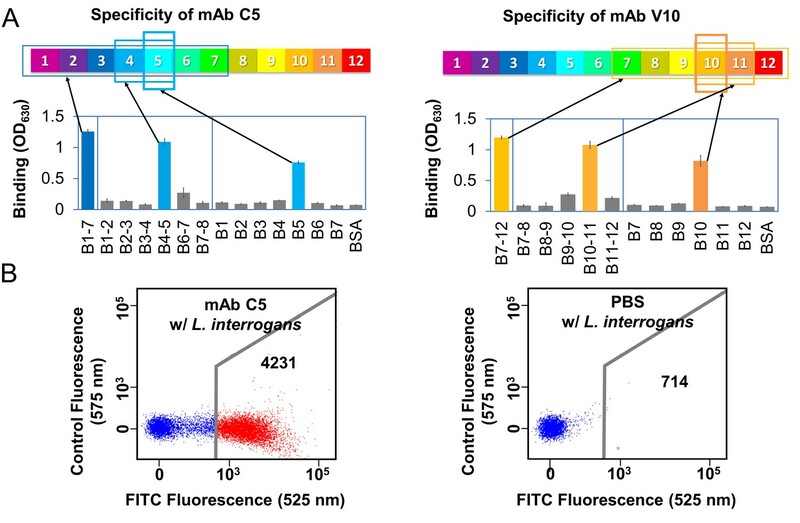 The representative fluorescence emission displays the relative binding of fluorescently-labelled secondary anti-mouse IgG antibodies to PBS-treated cells (negative control, right panel) and to mAb C5-treated cells (left panel). To test the role of the mAb libraries in promoting complement-mediated killing of Leptospira in vitro, the bactericidal activity of the LigB-binding mAbs was tested by incubating live L. interrogans serovar Pomona cells with complement-containing human serum with or without added antibodies. Using dark-field microscopy, motile bacteria were counted to calculate the survival rate at different time points. 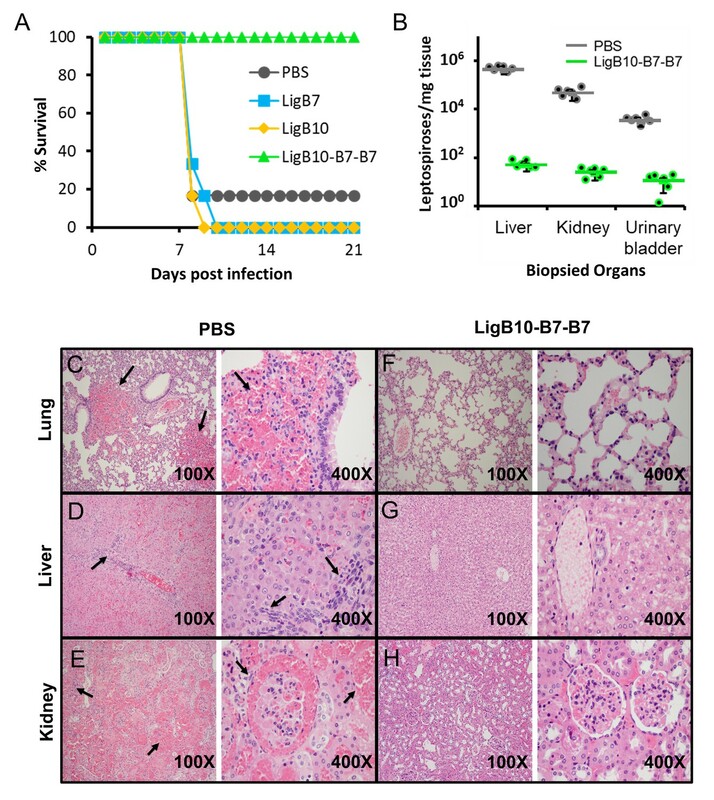 The PBS only (negative control) condition was unable to effectively kill the live Leptospira cells leaving an 84% survival rate at 120 min post treatment (Figure 5A). The hamster-derived polyclonal antibody (pAb) treatment of Leptospira cells led to an enhancement of bactericidal activity with only 63% survival at 120 min post treatment. Leptospira incubated with C5 or V10 mAbs showed only a 2% to 3% survival rate (a >20 fold improvement over pAb-incubated spirochetes p<0.05) (Figure 5A). (A, B) Leptospira survival assays were used to assess mAb bactericidal activity. (A) After incubation with individual mAbs, the survival rate of L. interrogans Pomona was observed using dark-field microscopy (B) while the survival rate of bioluminance-producing L. interrogans Manilae was measured using a 96-well luminometer-based assay (full dataset Figure 5—figure supplement 1). Each value represents the mean ± S.D. from three individual trials of two replicates. Statistically significant (t-test; p<0.05) differences were calculated from the comparisons between mAb-treated groups and the control group (*) or between mAb-treated groups and the pAb group (#). (C) A schematic is shown for the SAXS-derived LigB structure. (D) For the set of mAbs, the ELISA antigen binding value is plotted against the LD50. Points for mAbs are colored to match the three domain regions defined in the schematic. Statistically-determined outliers are labelled and data was fit with and without outliers (dashed line, R²=0.508 and solid line, R²=0.773, respectively). (E) For mAbs measured for cell surface binding, the FACS cell binding value is plotted against the LD50 and data is fit with and without outlier, mAb C23 (dashed line, R²=0.312 and solid line, R²=0.466, respectively). In addition, a high-throughput luciferase-based methodology was utilized to screen the bactericidal activity of the full set of mAbs. The assay measures the luminescence intensity from the expression of the light-generating lux cassette proteins in another pathogenic L. interrogans serovar Manilae to accurately report the viable cell count (Murray et al., 2010). Note that the LigB proteins from L. interrogans serovar Manilae and L. interrogans serovar Pomona share 96% identity suggesting that the bactericidal properties provided by the LigB (Pomona) mAb library using these two serovars would be similar. Bioluminescent L. interrogans serovar Manilae were again incubated with complement-containing human serum with or without added antibodies. The survival rate was determined by measuring the luminescence intensity of metabolically active Leptospira relative to that from the spirochetes prior to Ab-incubation. Both incubation time and antibody concentration were varied to obtain time-dependent and dose-dependent curves (Figure 5—figure supplement 1A and C, respectively) as well as LT50 and LD50 values (Table 1). Experimental analysis of luminometer measurements for control conditions and representative mAbs are presented in Figure 5B. The two negative controls, PBS only and non-specific mouse IgG1, as well as the hamster-derived pAbs were unable to kill >50% of cells at the longest time point (120 min) or at the highest dosage (100 µg/ml). All anti-LigB mAbs were able to eliminate >50% of Leptospira between 40 and 85 min with the exception of mAb C23 (Figure 5—figure supplement 1B). Each of the LigB-specific mAbs had the potential to kill >90% of the active Leptospira cells after a sufficient exposure time. All of the LigB-specific mAbs were able to effectively decrease the number of metabolically active Leptospira cells to less than 50% with a dose value (LD50) between 10 and 30 μg/ml (Figure 5—figure supplement 1D). The relative lack of efficiency of hamster pAbs compared to purified mAbs could be explained by the pAbs being a mixture of high affinity and low affinity antibodies, being a mixture of IgG subclasses with differing abilities to activate the complement system, or being derived from different rodents than the mAbs with potentially different abilities to activate the complement system. The ability of the anti-LigB mAbs to kill Leptospira in the presence of complement is consistent with their capability in binding to LigB protein in pathogenic Leptospira. In the context of a known antigen structure, the results of mAb-antigen interaction and mAb bactericidal activity experiments provide the opportunity to explore potential correlations between these three data sets. The broad mAb accessibility of LigB Ig-like domains supports the extended organization of the LigB1-12 SAXS structure. The LigB structure’s domain-domain arrangement is summarized in 3-domain segments (Figure 5C). The properties for each mAb have been correlated in plots of KD vs. LD50 (Figure 5D) or FACS cell binding vs. LD50 (Figure 5E). Additionally, the mAb data points are colored to signify the mAb’s LigB segments binding specificity. A trendline for KD vs. LD50 scatter plots using all data and excluding the two statistically-determined outliers (Figure 5D; Figure 5—figure supplement 2) yields correlations with R²=0.508 and R²=0.773, respectively. Antibodies specific to each of the four LigB segments are near the trendline. Thirteen anti-LigB mAbs were also tested for Leptospira surface binding ability. When plotted against LD50, FACS-derived cell binding values fit to a trendline with an R²=0.312 and the single outlier-adjusted trendline of with an R²=0.466 (Figure 5E; Figure 5—figure supplement 2). In both plots, near-trendline mAbs with specificity to the LigB1-3 and LigB4-6 segments have a relatively high binding ability and low LD50 and correlated mAbs with specificity to the LigB7-9 segment have a relatively low binding ability and high LD50. Because mAbs that do not fit the predicted correlation between binding affinity and bactericidal activity have the potential to inform vaccine studies, the bases for outlier discrepancies were examined further. Only one outlier, C12, displays enhanced bactericidal activity above what would be expected based from binding correlations. While C12 displays some specificity for the straightest segment (LigB4-6), it can bind to two single domains (LigB4 and LigB6) as well as a double domain in the segment LigB1-3. Further, an additional ELISA assay found that C12 is the only library C mAb that can also bind to LigB7-12 (Figure 5—figure supplement 3). The ability of C12 to bind to multiple Ig-like domains covering a large range of the Ig-like domain regions suggests a reason for the increased bactericidal activity relative to C12’s binding affinity. The only outlier with bactericidal activity below expected is C23 which binds to LigB2-3. These domain neighbors exhibit the sharpest interdomain bend suggesting that steric limitations can differentially effect LigB binding and bactericidal activity. Indeed, the kinked structure of C23’s target domain may decrease the rate for C23 to initiate bacterial killing relative to its KD (Figure 5—figure supplement 4). Overall, the link between antigen binding and bactericidal activity complements the highly accessible extended structure of LigB with highly accessible regions having the potential to yield high bactericidal mAbs. The high degree of correlation between antigen-mAb binding and bactericidal activity supports the hypothesis that a mAb’s ability to kill a pathogen can be determined by its antigen-specific binding affinity. To provide proof that a single Ig-like domain can act as a scaffold to display multiple protective epitopes, the binding epitope for anti-LigB mAbs was more specifically mapped to a surface within individual Ig-like domains. Chimeric LigB Ig-like domains were designed to differentiate interactions specific to the surface residues of major folding units. The high degree of homology between LigB Ig-like domains (Figure 6A and C) provided an opportunity for tertiary structural elements to be exchanged at two chimeric swapping positions (Ptak et al., 2014) (Figure 6A and B). The first two segments of the chimeras (β-strands A-C and β-strands C′-F) were engineered to separate the top and bottom halves of the Ig-like domain β-sandwich. The third chimera region (β-strands G-G′) was included to determine if an antigenic surface is formed on the untethered edge of the β-sandwich. Four single domain proteins that have been recognized to contain mAb-specific epitopes (Table 1) were paired based on matching length to generate two sets of chimeras (LigB5/LigB12 and LigB7/LigB10). Including the wild-type domains, eight possible chimeric combinations were generated on single Ig-like domains (Figure 6D and E). Dissection of mAb binding surfaces using chimeras. (A) Sequence alignment of LigB Ig-like domains used for generating chimeras. The chimeric swap regions are divided into colored boxes. Residues that are identical in either LigB5 and LigB12 or LigB7 and LigB10 pairs are shaded. (B) The structure of LigB12 (PDB ID 2MOG) is correspondingly colored by chimeric swap regions. (C) Average percent identity ± S.D. for each LigB Ig-like domain based on a pairwise matrix. (D) The set of LigB7 and LigB10 single domain chimeric constructs which cover all variations for the three swapped regions (schematic representation shown) were tested for binding to mAbs with LigB7-binding specificity (V34 and V3) or LigB10-binding specificity (V10) using an ELISA assay. 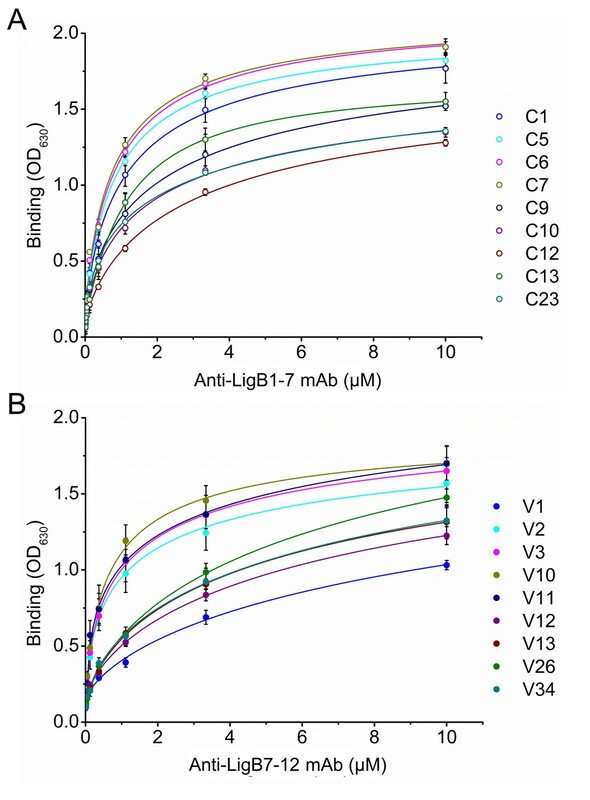 (E) LigB5 and LigB12 chimeras were similarly tested for binding to mAbs with LigB5-binding specificity (C5 and C6) or LigB12-binding specificity (V2 and V11). The ELISA binding values correspond to the chimeric construct representation at the top of the column. All ELISA experiments were conducted in three trials, the mean ± S.D. of which were shown in bar charts. All mAbs showed binding to a subset of the eight proteins with a clear region-specific pattern (Figure 6D and E). Two LigB7-specific mAbs (V12 and V34), two LigB10-specific mAbs (V1 and V10), and one LigB12-specific mAb (V2) could bind only to the N-terminal β-strands A-C from their respective interacting domains. The LigB5-specific mAb C5 and LigB7-specfic mAb V3 interacted with proteins that contained β-strands C′-F from LigB5 and LigB7, respectively. Unique to the LigB5/LigB12 mAb set, mAb V11 and mAb C6 required both the β-strands C′-F and the terminal β-strands G-G′ from LigB12 and LigB5, respectively. The mAb binding patterns demonstrate that the surface contribution of both β-strands A-C and β-strands C′-F (or C′-G′) can provide distinct epitopes for direct mAb targeting. The ultimate goal of combining structural and immunoreactivity studies of antigens is to explore a strategy for the rational engineering of improved vaccines. A chimeric LigB Ig-like domain was evaluated for the potential to elicit an immune response to multiple regions of LigB and to thereby enhance vaccine protection against leptospiral infection. The chimera LigB10-B7-B7 (β-strands A-C: B10 and β-strands C′-F and G-G′: B7) was chosen as the best candidate for animal studies because the chimeric domain possesses the ability to bind highly bactericidal mAbs specific to each parent domain (Figure 6—figure supplement 1). Additionally, LigB10-B7-B7 was similar to wild-type LigB7 and LigB10 in protein expression levels and in overall secondary structure (circular dichroism analysis, Figure 7—figure supplement 1). To generate a protective response, hamsters were immunized with 50 µg of LigB7, LigB10, LigB10-B7-B7, or PBS (as a negative control) for two times at 3 week intervals, and then challenged with 2.5 × 102 of triple passages of L. interrogans Pomona (Conrad et al., 2017; Kunjantarachot, 2014) (Figure 7A). On day 8, the leptospiral challenge was lethal for five of six hamsters inoculated with PBS group, three of five hamsters inoculated with wild-type LigB7, and four of five hamsters inoculated with wild-type LigB10. By day 10, all of the wild-type LigB7 and LigB10 immunized hamsters had either died or were euthanized due to severe clinical signs. In contrast, all five of the hamsters that had been inoculated with LigB10-B7-B7 and subsequently challenged with Leptospira survived until the end of the experiment (day 21 post infection). The survival rate of the LigB10-B7-B7 group is significantly higher (100%) than either control group (17%) or individual wild-type domain groups (0%) (p<0.05). Leptospira lethal challenge of hamsters immunized with LigB Ig-like domains. (A) Survival rates for groups of six immunized hamsters are shown for the 3 weeks post leptospiral challenge. Inoculations and boosters with specific LigB Ig-like domains occurred 3 and 6 weeks prior to leptospiral infection. Sera from immunized hamsters were tested for domain-specific immunoreactivity (Figure 7—figure supplement 2). (B) The indicated organ tissues were biopsied from post-challenged hamsters immunized with PBS (control) or LigB10-B7-B7. The leptospiral load of hamster tissue was determined by RT-qPCR for the Leptospira specific gene, LipL32. Each point depicts the mean value obtained from duplicate analysis of individual tissue samples. Bars indicate the mean bacterial loads ± S.D. (six hamsters per group). Leptospiral loads for the PBS group are significantly higher than those of the LigB10-B7-B7 group in all three tissues. (C-H) Post-challenged hamster tissues that are targets for spirochete infection were fixed by formalin and stained by hematoxylin and eosin. PBS (control) immunized hamster tissue exhibited (C) multifocal lung hemorrhage, (D) liver inflammation and necrosis, and (E) tubulointerstitial nephritis and hemorrhage in the kidneys (each indicated by arrows). (F-H) Tissue from the LigB10-B7-B7 immunized group were all within normal limits. Serological fluids collected during the hamster studies were tested for the ability of the immunizations to generate an effective humoral response using a direct ELISA binding assay. The sera from LigB domain immunized hamsters provided a strong antibody response against the corresponding immobilized recombinant LigB domain (Figure 7—figure supplement 2). LigB7, LigB10, and LigB10-B7-B7 boosters were able to further enhance the antibody response. The Anti-LigB10-B7-B7 sera was also reactive with wild-type LigB7 and LigB10 but failed to react with the negative control, LigB12. LigB10-B7-B7 immunization led to an increase in post-booster secondary response for IgG but not IgM antibodies implying the generation of a typical immune memory response (Figure 7—figure supplement 3). The serological tests indicate that targeted antibodies can be effectively generated by vaccines based on individual LigB Ig-like domains and chimeric domains. Several complementary methods were employed to test for the vaccine’s ability to reduce bacterial burdens of host tissue. Liver, kidney, and urinary bladder tissue from all immunization groups were examined by real-time quantitative reverse transcription polymerase chain reaction (RT-qPCR) to identify the Leptospira specific gene, LipL32 (Figure 7B) (Levett et al., 2005; Haake et al., 2000). The hamster group that received immunizations containing recombinant chimeric protein, LigB10-B7-B7, exhibited a significant reduction in leptospiral burden when compared to bacterial loads from wild-type LigB7 or LigB10 immunized hamsters. The immunized hamsters were further examined for histopathologic changes of livers, kidneys and lungs (Figure 7C–H and Figure 7—figure supplement 4). Except for one apparently normal hamster from PBS group, all other hamsters from PBS, LigB7 and LigB10 immunization groups presented severe clinical signs and prominent macroscopic lesions on spirochete-targeted organs (e.g. multifocal pulmonary ecchymoses, icteric liver and enlarged kidney). Lung lesions included thickening of alveolar septa due to edema, interstitial leukocytes infiltration, endothelial cell swelling, and extensive hemorrhage (Figure 7C). Leptospira-infected livers were infiltrated by various inflammatory cells, indicating moderate to severe hepatitis. Focal necrosis was also found in parenchymal hepatocytes, leading to loss of normal tissue integrity (Figure 7D). Severe tubulointerstitial nephritis with locally extensive hemorrhage in uriniferous spaces and tubules was present in Leptospira-infected kidneys (Figure 7E). Furthermore, greater than 50% of renal tubules were lost and replaced by lymphoplasmacytic cells infiltration and severe fibrosis. In contrast, all hamsters immunized with chimeric LigB10-B7-B7 presented no visible macroscopic/microscopic lesions in livers, kidneys or lungs (Figure 7F–H). In agreement with high survival rate of LigB10-B7-B7 immunized hamsters, vaccines containing the chimeric antigen provide superior protection and potentially sterilizing immunity for the animals from leptospiral infection. Leptospira, like other pathogenic bacteria, have evolved a wide variety of disease-related surface proteins to initiate colonization, to combat host defense systems and to reach target organs based on tissue-specific tropism (Ko et al., 2009; Vieira et al., 2014). Lig proteins contribute to pathogenesis by acting as both surface adhesins to mediate attachment to host extracellular matrix (ECM) molecules (Lin et al., 2009a; Vieira et al., 2014; Figueira et al., 2011) and recruiters of complement regulators to evade attack by the host’s innate immune system (Breda et al., 2015; Choy et al., 2007; Hsieh et al., 2016; Castiblanco-Valencia et al., 2012). In addition, Ig-like domains from LigB are currently some of the strongest recombinant protein-based vaccine candidates in protecting hamsters from lethal challenges although discrepancies in effectiveness suggest that vaccine redesign efforts could help to create an improved vaccine (Cao et al., 2011; Conrad et al., 2017; Yan et al., 2009; Adler, 2015). This study provides new information regarding the architecture and accessibility of the main host-interacting region of LigB. The elongated structure presents insight into the mechanism of Lig protein adhesion, but, more importantly, an analysis of the mAb exposed regions and lack of long range inter-domain interactions has provided guidance for the optimization of recombinant leptospirosis vaccines using homologous Lig protein domains. The domain arrangement of the LigB1-12 Ig-like domain region was determined using low resolution SAXS structures. The SAXS-derived LigB1-12 structure provides a visual depiction that complements the more therapeutically applicable information from mAb accessibility. The domain accessibility predicted by the LigB architecture also suggested that including the full set of Ig-like domains as antigens for mAb library generation was likely to be worthwhile. While previous SAXS studies have generated composite multi-domain structures (Jeffries et al., 2011; Morgan et al., 2012), the full LigB structure is the first example of using a sliding window of medium length, 5-domain constructs to generate a much longer 12-domain structure. The advantage of using a sliding window is that the high level of redundancy within the 5-domain structures allows for an increased accuracy in orienting and positioning the segments relative to each other. The sequence of domains LigB1-6 is identical to LigA domains 1–6 so the SAXS structure provides a partial structure of the LigA Ig-like domain region. While LigA is not present in all pathogenic Leptospira species, LigA-based vaccines, like LigB-based vaccines, enhance immunity to leptospirosis (Palaniappan et al., 2006; Silva et al., 2007; Faisal et al., 2009). Recombinant antigen-based vaccine technologies are the most promising avenue for the development of optimized protective strategies against leptospirosis. In recombinant antigen design, the basic antigen scaffold must present a native and well-folded epitope to the immune system while a minimized antigen can eliminate nonessential, disruptive features (Kulp and Schief, 2013). Examples of vaccines against different variants of Neisseria meningitides and Lyme disease Borreliae have been generated from chimeric recombinant antigens and have been capable of inducing broad spectrum bactericidal mAbs (Earnhart and Marconi, 2007; Scarselli et al., 2011). Ig-like domains are found in a variety of prokayotic and eukaryotic extracellular proteins and readily fold to their native structure (Bodelón et al., 2013). By incorporating various epitopes onto a homologous scaffold, the overall structural integrity of the antigenic surface can be maintained on the chimeric LigB Ig-like domain construct. Based on the high resolution LigB12 structure, each of the three chimeric segments encompassed a 900 to 2000 Å2 surface and could potentially make a full conformational epitope (Ptak et al., 2014). While only two of three LigB chimeric segments were able to present as a full epitope experimentally, the third segment was required for binding by several of the mAbs. Indeed, initial experiments suggest that a redesigned chimera can harbor three separate epitopes on a single LigB Ig-like domain scaffold. Interestingly, the single domain LigB10-B7-B7 provides better protection to hamsters than two longer constructs, LigB7-12 (which provided poor protection) and LigB1-7 (which provided good protection) (Yan et al., 2009; Conrad et al., 2017). Exposure of epitopes in single domain antigens which would otherwise be blocked by host factors (Beernink et al., 2011) (i.e., ECM or serum proteins [Lin et al., 2009a; Breda et al., 2015; Hsieh et al., 2016]) in multi-domain constructs may enhance the efficiency. Two future goals of LigB recombinant vaccine studies will be to optimize further the chimeric antigens, consciously limiting the functionality of host-interacting sites, and to offer cross-species protection against different serovars. This study and other recent studies (Ptak et al., 2014; Conrad et al., 2017) have significantly advanced our understanding of Lig protein structure and the potential of recombinant vaccines. The field of leptospirosis is poised to take advantage of the new insights and could make significant improvements in vaccines and other treatments to reduce the agricultural and human impact of the pathogen, Leptospira. A series of single (LigB1 to LigB12), double (LigB1-2 to LigB11-12, excluding LigB5-6), five-domain (LigB1-5 to LigB8-12), and multiple (LigB1-7, LigB7-12, and LigB5-12) Ig-like domains of LigB from Leptospira interrogans serovar Pomona (GenBank, FJ030916) (illustrated in Figure 1—figure supplement 1A, Figure 2—figure supplement 1A, and Figure 4—figure supplement 1) were constructed on the vector pET28-His-Sumo between BamHI and HindIII (or XhoI) restriction enzyme sites as previously described (Manford et al., 2010; Lin et al., 2009b; Lin et al., 2009a). The constructed plasmids containing LigB genes were transformed to E. coli Rosetta strain and the protein expression was induced with 1 mM isopropyl β-D-thiogalactopyranoside (IPTG) at 20 ˚C for 16 hr. After the cells were lysed using a high-pressure cell disruptor, the cell lysates were spun down and the supernatants were purified by Ni-NTA resin (Qiagen). The His-Sumo tagged LigB proteins were eluted with phosphate buffered saline (PBS; 137 mM sodium chloride, 10 mM sodium phosphate, 2.7 mM potassium chloride, 1.8 mM potassium phosphate) containing 300 mM imidazole and then digested with Sumo protease Ulp-1 while dialyzing against PBS buffer at 4 ˚C overnight (Manford et al., 2010). Afterwards, the digested proteins were applied to a second Ni-NTA resin to remove the His-Sumo tag, and the untagged proteins were collected in the flow-through fraction. To gain higher protein purity, the untagged Lig proteins were further separated from other contaminates by size exclusion chromatography (SEC) Superdex75 (GE Healthcare), resulting in only one major species migrating on SDS-PAGE. For secondary structure analysis, circular dichroism (CD) spectra of LigB proteins were measured on an Aviv 202–01 spectropolarimeter (Aviv Biomedical, Lakewood, NJ) and predicted secondary structure composition was obtained using BeStSel (Micsonai et al., 2015). Chimeric LigB5/LigB12 and LigB7/LigB10 constructs were created by overlapping extension PCR to produce all six possible swapped genes from three protein segments (Figure 6). The three segments, strand A-C, strand C′-F and strand G-G′, and specific residue boundaries were identified based on the high-resolution NMR structure of LigB12 (PDB ID 2MOG) (Ptak et al., 2014) and the sequence alignment of parent domains. The percent identity matrix for the set of Ig-like domains was obtained using the EMBL-EBI web service Clustal Omega (McWilliam et al., 2013). After ligation into pET28-Sumo vectors, the selected positive constructs were isolated from kanamycin resistant colonies and confirmed by DNA sequencing. Constructs corresponding to two, five and eight domains were generated to identify the optimal domain number required to obtain useful SAXS-derived envelopes (Figure 1—figure supplement 1). The 8-domain long construct (LigB5-12) failed to generate envelopes with distinct domain regions representative of possible 8-domain structures. High average normalized spatial discrepancy (NSD) values for a reconstruction indicate increased variability among the trial models used to build the final envelope. Increasing average NSD with longer constructs may reflect a wider range of conformations expected with longer chains but additional factors could influence NSD statistics for longer constructs. The maximum diameter of a model is limited by the minimum q value measured in the scattering profile, as dictated by the Shannon Limit (Putnam et al., 2007). Thus, for these experiments, q_min = 0.1 implies that models can be no longer than pi/0.1 = 314 Å, under ideal conditions. In reality, minor aggregation and noise at low q may also place additional limits on model length. Mylonas and Svergun have also shown that reconstructions of long rods are not as reliable as more compact structures (Mylonas and Svergun, 2007). For these reasons, we have chosen to assemble a full-length model from shorter overlapping constructs. SAXS envelopes derived from two or five sequential domains were generally comprised of distinct domain regions and accurately reflected the number and size of expressed domains. Of the 2- and 5-domain structures, only the envelopes of five sequential domains provided the relative orientation of multiple neighboring domains. LigB-derived proteins were exchanged into PBS buffer (pH 7.4) and concentrated to 12–20 mg/ml as assessed by absorption at UV280. SAXS data for individual samples was measured for 15 scans at 1×, 2/3×, and 1/3 × protein concentrations after dilution with PBS buffer and centrifugation at 14,000 rpm for 10 min. Capillary cells were robotically loaded with 30 μL samples from a 96 well-plate maintained at 4°C (Nielsen et al., 2012). Between each sample, the capillary cell was thoroughly washed with detergent and water and then dried with air. All SAXS experiments were collected at the Cornell High-Energy Synchrotron Source (CHESS)’s F2 or G1 beamline using a dual Pilatus 100 K-S SAXS/WAXS detector (Acerbo et al., 2015; Skou et al., 2014). Background subtraction of SAXS buffer and further data and statistical analysis were performed using the free open-source software, RAW (Nielsen et al., 2012; Hopkins et al., 2017). The GNOM program from the ATSAS suite was used to determine P(r) plots. Optimal Rmax was determined by screening at 5 Å intervals and the P(r) plots were normalized to the first peak. Profiles best representing the dilute (ideal) solution limit were used to generate ab initio models with DAMMAVER and DAMMIF programs from the ATSAS suite (Petoukhov et al., 2012; Volkov and Svergun, 2003). 10 initial models were used to calculate the final model. Models with a normalized spatial distribution > mean + 2*standard deviation were treated as outliers and not included in determining the final model. No more than one model was excluded for each structure. Model uniqueness was evaluated using the AMBIMETER program (Petoukhov and Svergun, 2015). AMBIMETER score ranges < 1.5 indicate a unique ab initio shape determination, 1.5–2.5 indicate some potential for alternate solutions, and >2.5 indicate that multiple shape solutions will fit the data. A 5 mg total of LigB1-7, and separately 5 mg of LigB7-12, was used to immunize and boost the antibody production from five BALB/c mice. Hybridoma clone generation was conducted in the laboratory of Dr. William Davis (fee-for-service) as previously described (Park et al., 2015). Standard ELISA assays were used for in-house screening of the hybridoma clones for positive supernatants. A total of 24 clones of IgG-type mAbs against LigB1-7 (library C; Lig protein Conserved region) and 36 clones of IgG-type mAbs against LigB7-12 (library V; Lig protein Variable region) were generated. Each library produced 9 mAbs which were found to be of moderate to high binding efficiency and utilized for further characterization. Purification of mAbs was conducted by protein A/G chromatography (Pierce) using the manufacturer-recommended procedure with minor modification (Eliasson et al., 1989). Briefly, the hybridoma supernatant was dialyzed against the binding buffer (100 mM potassium phosphate, 150 mM sodium chloride, pH 8.0) overnight at 4 ˚C. The dialyzed sample was applied to a protein A/G column (pre-equilibrated with binding buffer). After washing with 10–15 ml of binding buffer to remove the unbound fraction, the bound mAb was eluted with 100 mM glycine at pH 3.0 and neutralized immediately with 1 M Tris at pH 9.0. The eluate containing mAb was dialyzed against PBS buffer at pH 7.0, concentrated to 3–4 mg/ml, and stored at −80 ˚C. LigB-binding mAbs were selected using an ELISA assay (Lin et al., 2009a; Lin et al., 2011). Microtiter plates (Nunc MaxiSorp, ThermoFisher Scientific) were coated with 1 μg of LigB1-7 or LigB7-12 in coating buffer (0.2 M NaHCO3, pH 9.4) at 4˚C overnight. After blocking with 3% BSA in PBS buffer for 1 hr, hybridoma supernatants were prepared at 1/500 dilutions and individually applied to LigB-coated wells for initial screening. To obtain dissociate constants, selected mAbs with moderate to high binding affinity to LigB were serially diluted in PBS (0.00686, 0.0137, 0.0412, 0.123, 0.370, 1.11, 3.33 and 10 µM) and then individually applied to LigB-coated wells. Between each step, PBS containing 0.05% Tween-20 (PBS-T) was used to wash the plates for three times. Subsequently, anti-mouse IgG antibody conjugated with HRP (1:5000, Invitrogen) was added to detect the binding of mAbs presented in hybridoma supernatants. Finally, 100 μl of TMB peroxidase substrate (KPL) was applied to each well, the optical density of which was recorded at 630 nm by ELx808 Absorbance Microplate Reader (BioTek). OD630 values represent the mean of three independent trials ± the standard deviation. For each trial, samples were assayed in two replicates. For examining the domain specificities of mAbs, single domain LigB fragments (LigB1 to LigB12), double domain LigB fragments (LigB1-2 to LigB11-12, excluding LigB5-6), positive control (LigB1-7, LigB7-12), or negative control (BSA) were coated with a fixed concentration (1 μg/well) on the ELISA plates. Each mAb against LigB1-7 or LigB7-12 was then added to corresponding single-domain or double-domain LigB coated wells. For binding analysis of each chimera, the set of six chimeric LigB proteins plus the two parent LigB proteins were coated on the ELISA plates (1 μg/well). Each mAb with activity against either of the two parent LigB proteins was screened for binding activity on the LigB coated wells. For measuring the antibody responses triggered by LigB-based recombinant vaccines, sera from hamsters immunized with LigB7, LigB10 and LigB10-7-7 were collected at different time points (pre-immunization, post-immunization and post-booster). Then, these serum samples (1:500) were added to corresponding LigB Ig-like domain coated wells (1 μg/well), and also applied to LigB12 coated wells (negative control). Finally, anti-hamster IgG or IgM antibody conjugated with HRP (1:1000, KPL or SouthernBiotech) was used to detect the LigB-bound antibodies from hamster sera. All single and double domain ELISA experiments including single chimeric domain experiments were conducted in three trials, the mean ±S.D. of which were shown in bar charts. Leptospira interrogans freshly harvested from hamsters challenged with serovar Pomona or overnight NaCl-treated low passage Leptospira were prepared in PBS buffer containing 5 mM MgCl2 at 108 cells/ml. Various anti-LigB mAbs (100 µg/ml) were individually applied to the bacterial suspension at 1:500 dilution. After a 1 hr incubation at room temperature, the bacteria-mAbs mixtures were spun down at 2,000 g for 7 min and then washed with PBS containing 1% BSA. Subsequently, goat anti-mouse antibodies conjugated with fluorescein (FITC) (1:1000) were used as secondary antibodies for probing the bacteria-bound mAbs. After another PBS-BSA wash, the bacteria-mAbs mixtures were fixed by 0.5% formaldehyde in PBS. The non-pathogenic Leptospira biflex, which does not express LigB, was subjected to the same procedure by incubating with selected mAbs for the control experiments (Figueira et al., 2011). Another negative control was conducted by treating the pathogenic Leptospira with unrelated mouse IgG (isotypic mouse IgG purchased from ThermoFisher Scientific). Flow cytometry was performed at the Cornell University Flow Cytometry Core facility using a BD LSR-II (BD Biosciences) instrument with the excitation laser at 488 nm and the emission wavelength at 525/575 nm. Unstained Leptospira was identified by forward scatter (FSC) and side scatter (SSC). Selected mAb (C5) treated L. interrogans without secondary antibodies (FITC-conjugated goat anti-mouse IgG) was used as a negative control to set the gating region. The mean FITC-positive (MFI) count was obtained for the gated region of the 525 nm vs. 575 nm scatter plots using BD FACSDiva software. For each sample, at least 20,000 cells were analyzed in two independent trial of two replicates. To examine if the mAbs were effective at killing bacteria in vitro, the serum bactericidal activity (SBA) assay was conducted. 108 cells/ml of low passage, high virulent L. interrogans seorvar Pomona and Manilae strain M1307 were prepared in PBS buffer containing 2 mM MgCl2 and 1 mM CaCl2, and then mixed with respective mAbs, plus 25% of normal human serum (ImmunoReagents) as a complement source. The mixtures were incubated at 37°C for 1 hr, and the viability of the bacteria were examined using dark-field microscopy. The survival rate of leptospira was calculated as the number of motile (alive) cells in every 100 counts separately by two researchers (blind). The mean value was obtained from the two independent (blind) measurements as a single technical replicate. Three independent trials of two replicates were measured. The viability of the leptospira was also accessed from the luminescence emitted by metabolically active L. interrogans Manilae strain M1307 (Murray et al., 2010). The same preparations were examined at different time points (0, 30, 60 and 90 min), and the luminescence intensity of each sample was measured by GloMax 96 Microplate Luminometer (Promega). The survival rate of leptospira was calculated by the intensity at a specific time point divided by the intensity at 0 min. In addition, a series of dilutions of mAbs (100 μg/ml to 3.125 μg/ml) were evaluated for dose dependent bactericidal efficacy of antibodies. The time (LT50) and dose (LD50) required to reach 50% lethality were obtained from fitted logistic and dose inhibition curves, respectively (Origin 7.0). Hamsters (Harlan Sprague Dawley Laboratory) were housed in isolation units approved by the Cornell University Institutional Animal Care and Use Committee (Protocol number: 2015–0133). The Golden Syrian Hamsters used in vaccine trials were allowed to run free in the cage, were fed a commercial ration, and were provided water ad libitum as previously described (Kunjantarachot, 2014). Six 5-week-old hamsters each were vaccinated subcutaneously for each LigB-based recombinant vaccine containing adjuvant 2% Alhydrogel (InvivoGen) at 3 week intervals for a total of two injections. The control group was injected with adjuvant only. Three weeks after the final vaccination, all animals were challenged with 2.5 × 102 of triple passaged L. interrogans seorvar Pomona through the intraperitoneal route as previously described (Kunjantarachot, 2014). Kidneys, livers, lungs and urinary bladders were biopsied from hamsters within 1 hr after euthanasia (Palaniappan et al., 2006). Leptospiral loads found in livers, kidneys and urinary bladders from all immunization groups were examined by real-time RT-qPCR (Levett et al., 2005). The total RNA was extracted from target tissues and then reverse transcribed to cDNA. Subsequently, the Leptospira specific gene, LipL32 (Haake et al., 2000), was amplified and detected with fluorescence by 7500 Fast Real-Time PCR system. Histopathological tissue slices were fixed with 10% neutral buffered formalin and stained with hematoxylin and eosin. Tissue samples were imaged and scored by light microscopy. Journal of Synchrotron Radiation 22:180–186. Current Topics in Microbiology and Immunology 387:251–272. The Journal of Immunology 186:3606–3614. PLOS Neglected Tropical Diseases 9:e0004192. The Journal of Infectious Diseases 205:995–1004. PLOS Neglected Tropical Diseases 11:e0005441. PLOS Neglected Tropical Diseases 9:e0003898. A Universal Vaccine against Leptospirosis: Are We Going in the Right Direction? Journal of Applied Crystallography 50:1545–1553. PLOS Neglected Tropical Diseases 10:e0004974. Journal of Molecular Biology 414:735–748. Current Opinion in Virology 3:322–331. Journal of Vaccines & Vaccination 05:239. PLOS Neglected Tropical Diseases 11:e0005349. Journal of Medical Microbiology 54:45–49. Journal of Biological Chemistry 284:19380–19391. Journal of Biological Chemistry 284:23547–23557. Infection, Genetics and Evolution 9:196–205. Journal of Clinical Microbiology 48:2037–2042. Journal of Applied Crystallography 40:s245–s249. Journal of Applied Crystallography 45:213–223. Veterinary Immunology and Immunopathology 163:216–220. Acta Crystallographica Section D Biological Crystallography 71:1051–1058. Virulence of the zoonotic agent of leptospirosis: still terra incognita? Quarterly Reviews of Biophysics 40:191–285. The Journal of Experimental Medicine 213:469–481. Journal of Applied Crystallography 36:860–864. Thank you for submitting your article "Extended structure of a Leptospira antigen offers high bactericidal antibody accessibility amenable to vaccine design" for consideration by eLife. Your article has been reviewed by three peer reviewers, and the evaluation has been overseen by a Reviewing Editor and Wendy Garrett as the Senior Editor. The reviewers have opted to remain anonymous. Leptospirosis is a widespread zoonotic bacterial infection that can cause serious disease in both animals and humans and can be refractory to treatment. Prevention is hampered by the fact that current vaccines are only partially effective. 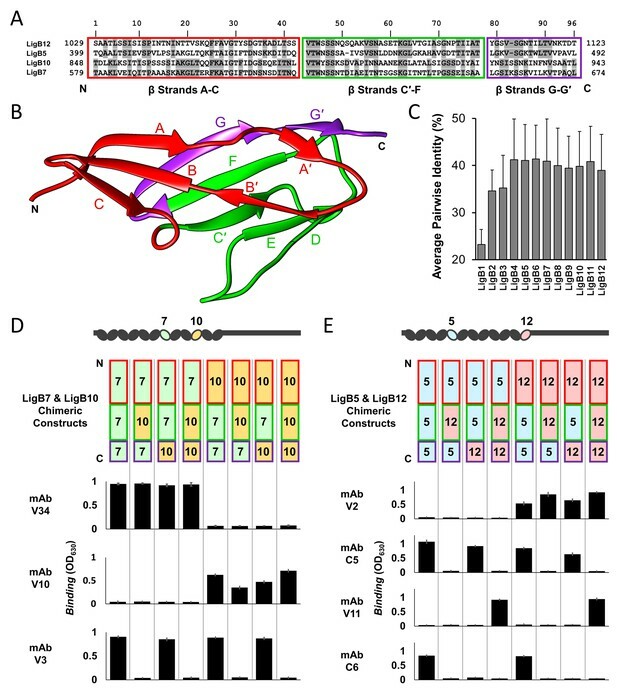 The work by Hsieh, et al., uses structural information of the immunoglobulin-like domains of a common Leptospira coat protein, LigB, to rationally design a recombinant multi-epitope antigen that appears to provide superior protection that either the full-length proteins or its individual domains. The present manuscript represents a dizzying amount of work, including comprehensive SAXS analysis of the multi-domain LigB protein and generation and characterization of two mAb libraries against LigB domains. Overall, the manuscript is well-written and easy to parse. Some questions, however, should be clarified. 1) While the authors make a point of highlighting the importance of the SAXS data to their design efforts, in reading the paper, it seems that the NMR structures of the individual domains were really the drivers (i.e., it really seems that the recombinant antigen could have been designed with only the NMR structure and the ELISA data). If the authors are presenting this as a roadmap to others, they might either better explain how the SAXS data really were critical, or change their language a bit. 2) In Figure 5D, is it really appropriate to arbitrarily pick data in order to get a decent R2 for a linear fit? The authors briefly discuss the outlying mAbs – C12 and C23, but it seems that authors missed a huge opportunity in understanding what drives a much worse than expected and much better than expected activity vs. affinity, which has the potential to inform other rationally designed vaccination efforts. 3) While potentially outside of the scope of the present work, it seemed odd that the authors did not compare or even mention differences in memory response when using different vaccination strategies. 4) The main text does not state where the 60 antibodies are coming from. Why where there only 60? How many hybridomas have been screened in total? An explanation is only given in the Materials and methods. Additionally, the data for the screening of the antibodies should be presented in its entirety and not buried in the supplement. Only then the reader can fully appreciate how the lead antibodies have been identified. Perhaps a heatmap indicating the binding would be better suited to represent the data. 5) The positive control for bactericidal activity is a polyclonal hamster antibody, while the authors test mouse antibodies. Is it possible to discuss the lack of efficiency of the hamster polyclonal in greater detail? Why not use a mouse polyclonal as control? 6) When describing in Figure 5 and supplements the bactericidal activity of the antibodies the authors leave binding affinity completely out of the picture. Without the knowledge of affinity, the authors cannot be sure if the bactericidal activity is due the recognized epitope or affinity of individual antibodies. 7) In the vaccination experiment the authors describe that hamsters vaccinated with the chimera B10/7/7 have a better chance of survival when infected with Leptospira than hamsters vaccinated with B10 or B7, respectively. The better control would have been hamsters simultaneously vaccinated with a mixture of B10 and B7. Also, the ELISA in Figure 7—figure supplement 2 lacks controls. The authors should add to the LigB7 and LigB10 sera ELISA the same controls as for the chimera. Additionally, the result should be added to main figure in the text. We have adjusted our language regarding how the SAXS data was influential in developing the study. Specifically, we have changed the impact statement, the final sentence of the Abstract, and the final sentence of the Introduction. We agree that, in hindsight, the immunoreactivity mapping experiments could have been designed to inform the accessible features of the antigen without the SAXS data. Still, the initial SAXS study yielded a low-resolution structure that suggested generating monoclonal antibodies would be worth the expense for both LigB1-7 and LigB7-12 regions. This is now noted in the Discussion section. If the SAXS study had revealed that some domains were clearly buried, then these regions could have been excluded from the generation of the mAb library. The SAXS data and immunoreactivity data offer complementary views of the overall structural architecture which also creates elements of redundancy. For Figure 5D, we agree with the reviewers that outliers should not be picked arbitrarily and also agree that identified outliers could be useful and informative. We now use a statistical method to determine the outliers in both Figure 5D and 5E correlation plots. A supplemental figure (Figure 5—figure supplement 2) has been added to show the Cook’s distance for the data in the correlation plots. For Figure 5D in particular, the outliers greatly influence the regression line so the R2 is reported for both the total dataset and the dataset without the statistically-determined outliers. Additionally, we have included further discussion with regard to the identified outliers, C12 and C23. Please note that we have changed the Y-axis of the plot in Figure 5D from a relative ELISA binding measurement to a KD based on ELISA. While C12 was determined to be a statistical outlier in both the original and new Figure 5D plots, the KD value of C12 is closer to the expected value from the fitted correlation. We note that C12 binds to two double and two single LigB Ig-like domains within LigB1-7 (not LigB7) and therefore may bind to a conserved region of the domains. To test if C12 was promiscuous enough to also bind to LigB7-12, an additional ELISA was performed to assess the possibility of interactions between library C mAbs and LigB7-12. C12 was the only mAb with significant binding to LigB7-12 suggesting that the ability to bind to several LigB Ig-like domains allows C12 to more effectively kill bacteria. A supplemental figure (Figure 5—figure supplement 3) has been added to show C12 binding to LigB7-12. The other statistically identified outlier, C23, is less effective in bactericidal activity than expected based on both antigen binding and cell surface binding experiments. We suggest that the kinked structure of the LigB domains at the C23-binding site may play a role in decreasing its ability to initiate the cell death inducing cascade. The steric restriction combined with the target domain’s proximity to the leptospiral surface could slow mAb accessibility. Assays for antigen and cell surface binding are less dependent on time as incubation times were long enough to reach equilibrium. The bactericidal activity assay was inherently dependent on time which is compounded by time delays imposed by activation of the downstream complement cascade. We analyzed the correlation between LD50 vs. LT50 in the bactericidal assay using Cook’s distance and found C23 to be the only statistical outlier (Figure 5—figure supplement 4). In a plot of KD vs. LT50 (Figure 5—figure supplement 4), C23 displays even weaker bactericidal activity relative to other mAbs than in the KD vs. LD50 plot. The effect of time on the bactericidal activity of C23 is larger than for other mAbs. One possible reason, the LD50 measurement was assessed at the longer time point of 90 minutes while LT50 is also influenced by measurements at 60 minutes. The comparison of bactericidal activity measurements suggests that the bactericidal activity of C23 could be impaired by conformationally inhibited binding leading to slower than expected bacterial killing. We include a figure to illustrate the relative IgG and IgM response to LigB10-B7-B7 immunization (Figure 7—figure supplement 3). As expected, a larger secondary immune response is observed for IgG only. The additional data is now mentioned in the Results section titled “Chimera LigB10-B7-B7 confers enhanced protection against Leptospira lethal challenge”. We have added a Results section specifically for the description of the mAb library creation and screening. Figure 2 (previously a supplement) has become a main text figure and subsequent figures have been renumbered accordingly. Figure 2B depicts the ELISA screen and cutoff used to select hybridomas for detailed analysis. For each library, two sets of 12 hybridoma supernatants were tested in the initial screen. An additional 12 hybridomas were needed to be screened in library V (LigB7-12) to identify 9 total mAbs with the desired ELISA cutoff (OD630 = 1). The screening data is presented in its entirety. We now provide more detail on how the antibodies were obtained in both the added Results section and the Materials and methods. A heatmap of the data was unable to depict the ELISA cutoffs so we are presenting the data as a bar graph. An additional supplementary figure (Figure 2—figure supplement 1) was added to show the distribution of relative binding efficiencies. This histogram helps to illustrate how the lead mAbs were identified. In the serum bactericidal assay, the no antibody and isotypic mouse IgG groups are the true controls for the assay. We now do not refer to the hamster anti-LigB polyclonal antibodies as a control in the manuscript. We agree with the reviewers that the mouse pAb would have been a better control; Unfortunately, mouse pAbs were not retained during the mAb library creation and are therefore not readily available. Hamster anti-LigB pAb were retained from vaccine trials and was easily included in the bactericidal assay. Because the result suggests that the mAbs generated in this study are more effective at killing Leptospira than hamster anti-LigB pAb that would be generated using the conventional leptospirosis animal model, we felt the data should be included but we are willing to remove the data if the reviewers would prefer taking it out. There are three possible explanations for the lack of hamster pAb efficiency. First, the pAbs are likely to include both high affinity and low affinity anti-LigB antibodies and also background antibodies with no affinity for LigB. The effectiveness of pAbs are likely to be reduced because the concentration of high affinity anti-LigB antibodies is lower for a pAb solution of the same overall concentration as for a solution the purified mAbs. Second, pAbs contain a mixture of IgG subclasses (IgG1, IgG2a, IgG2b and IgG3). The ability of the different hamster-derived IgG subclasses to effectively activate the complement system is unknown; however, different IgG subclasses from both mouse and human exhibit variability in their effectiveness at activating the complement system. Third, while the ability of mouse antibodies to activate the human complement cascade is known, the relative ability of hamster antibodies to activate the same cascade has not been described. Because we do not know if mouse and hamster antibodies are equally efficient at eliciting the killing response, we cannot rule out the possibility that hamster antibodies are less effective in the assay. We now discuss the possible reasons for the lack of hamster pAb efficiency in the Results section of the manuscript (titled “Bactericidal activity of anti-LigB mAbs”). We agree with the reviewers that binding affinity (KD) is a more accurate measurement of mAb-antigen interactions than the ELISA-derived relative antigen binding measurement. We have replaced the relative binding measurements with KD values. KD values for purified mAbs were determined by fitting concentration-dependent ELISA measurements. We have replaced the relative binding measurements with the concentration-dependent ELISA curves and KD values (new Figure 3 and Figure 3—figure supplement 1). KD values have also replaced the relative binding measurements in Table 1 and the correlation plot with LD50 for bactericidal activity (Figure 5D). Overall, the LD50 correlation plot using KD is similar to the plot using relative ELISA binding measurements with C12 and C23 being identified as the only two statistical outliers in both plots. The KD vs. LD50 shows a high enough correlation (R2 = 0.773) to suggest bactericidal activity is dependent on binding affinity for most mAbs. The outliers, C12 and C23, were explored further in the three added supplements to Figure 5 to understand the basis for their non-conformity. We have added the requested controls for Anti-LigB7 and Anti-LigB10 sera ELISA to Figure 7—figure supplement 2. A reference to the figure supplement was added to the main figure legend. There are several reasons why we feel that the benefits of the additional control would not be an ideal control and do not warrant significantly delaying the publication of this manuscript. From a manufacturing standpoint, purification and subsequent mixing of domains would be costlier than purification of a single domain. This control would not generate a useful result in and of itself. Additionally, we show a robust gain in vaccine efficiency and the importance of a positive control would be minimal. Also, since all of the vaccines used in the trial were single domain proteins from a single purification, the inclusion of a mixed protein solution would not be a direct comparison. While a vaccine trial that included another control with a mixture of LigB7 and LigB10 could have been added, the additional vaccine trial would require 3-4 months to complete. Again, we argue that the small benefit of the additional vaccine trial control does not warrant the time commitment and delay that it would require. The authors thank the laboratory of Dr. William Davis for hybridoma generation, the Flow Cytometry Core at Cornell University for help with flow cytometry experiments, Dr. Cynthia Leifer and Jody Lopez for graciously providing access to their luminometer, and Dr. Holger Sondermann and Alex Devarajan for critically reading the manuscript. We also thank Dr. Gerald Murray and Dr. Ben Adler for generously giving luminescent L. interrogans Manilae strain M1307. CHESS is supported by the National Science Foundation (NSF) and NIH/NIGMS via NSF award No. DMR-1332208, and the MacCHESS resource is supported by NIGMS award GM-103485. Animal experimentation: Animals were housed in isolation units approved by the Cornell University Institutional Animal Care and Use Committee (Protocol number: 2015-0133).